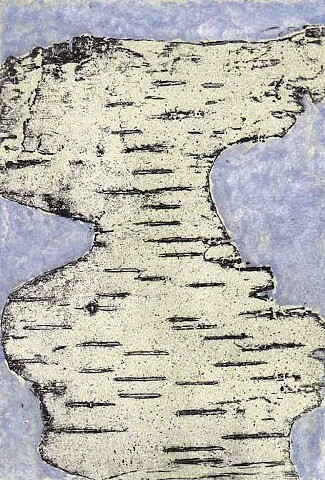 A piece of bark from a white birch yielded the patterns in this print which remind me of an old map. The bark was pressed into the soft wax covering of a copper plate; The bark lifted the wax to reveal its pattern in the shiny copper. This pattern was then chemically etched into the copper to yield the deeply incised printing plate for this print. Akua water-based inks were used to introduce the blues and greens of this monoprint.